Storyteller Mandy Hu had it down to a science. Not only could she perfectly time walking or running to catch those evening BART trains back to San Francisco. She also had a catalog of other passengers she could reference in order to best navigate the crowds. Then one night, working late, she was thrown off-schedule by a coworker whose immigrant experience really struck a cord. Mandy delighted the audience at Muni Diaries Live in April. Watch the video of her story above. ChrisO is a musician and hair stylist at Honeycomb Salon in Noe Valley who has an impressive record collection. He regaled the Muni Diaries Live crowd a few weeks ago with a story of running into someone he knew from a past life on the bus, and you’ll have to watch the video to see what he found out. Do you have a Muni story of your own or know someone who can spin a great tale? Email us and pitch your story at muni.diaries.sf@gmail.com! 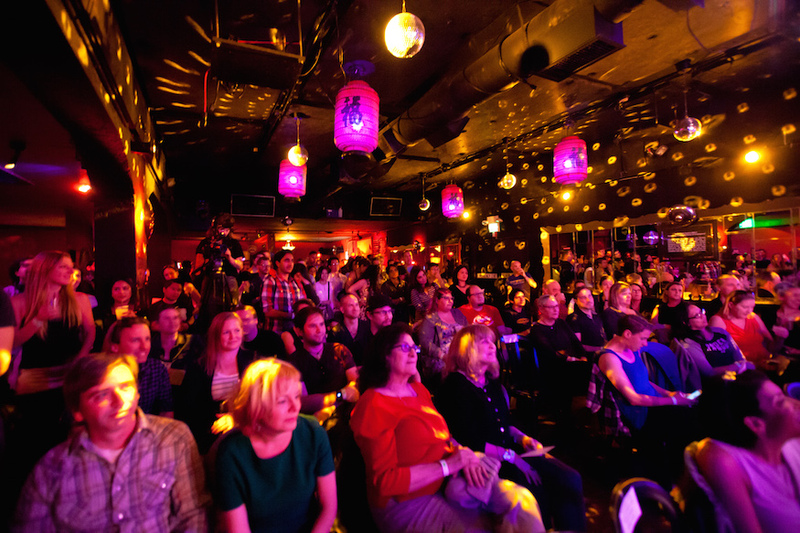 What happens when you pack the Elbo Room with Muni riders who love nothing more than a good story? Amazing tales, a new spin on bingo, and an only-in-San Francisco burlesque act that put old paper Fast Passes to very good use. At our 15th show, we were still floored by the enthusiasm and support of everyone who came to Muni Diaries Live, especially our storytellers who really dug deep into their San Francisco experience to share stories that are both funny and vulnerable, and serve as excellent reminders of why public transit is an important part of any urban existence. We kicked off the show with Muni Diaries Live alum Jesse James, whose friends are constantly amazed at his endless supply of Muni tales. This Saturday: Muni Burlesque, Muni Bingo, and Only-in-SF stories! Where can you find a club full of people who love San Francisco as much as you do, aren’t too snooty to ride the bus, and will cheer at the mention of “Back Door!”? You’ll find good company at Muni Diaries Live this Saturday, where you can raise a glass with your fellow commuters and toast to the hilarity of riding Muni (and BART, too!). We’ve got a stellar lineup of performers with all the funny, sweet, and sometimes totally WTF stories that happen on Muni and BART. And for this show, we have the lovely Alexa Von Kickinface, co-host of San Francisco’s infamous and beloved monthly burlesque show—Hubba Hubba Revue! Muni plus burlesque? You’ll have to see it for yourself. Oh, and dust off your bingo daubers! For the first time, we’re playing Muni Bingo, and you can win free drinks at the Elbo Room bar! My hands are currently covered with glue from renaming all 75 bingo balls to Muni lines, so make it all worthwhile and come play Muni bingo with us! There are only a handful of tickets left in advanced sales, so get your tickets soon! 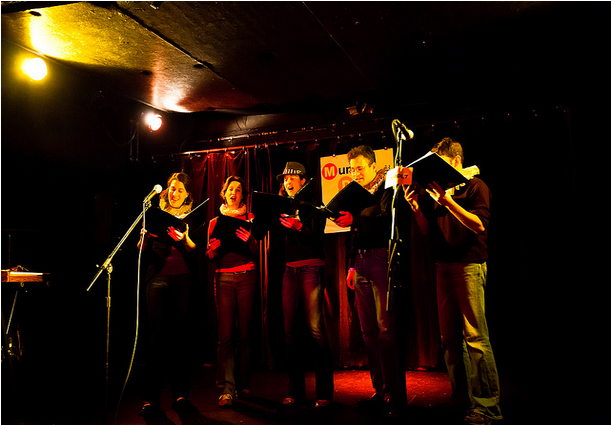 Live at the Elbo Room: Muni Stories and Muni Bingo! Anything can happen on Muni, but would you ever have imagined a Muni-themed madrigal choir, a hip-hop group whose entire album is about Muni, or Muni riders in a Rice-a-Roni singalong? Me neither, and yet these are just a few of the only-in-San Francisco hilarious things that have really happened at Muni Diaries Live over the years. We’re a short few weeks away from our spring Muni Diaries Live show, as always with an excellent lineup. For this event, we’ve got a little something for the hipster (or grandma) in you: a Muni bingo game! Get your bingo daubers ready to win great prizes, booze or otherwise! Grab your tickets here, and we’ll see you soon! Save the Date: Muni Diaries Live, April 16! It’s that time again! 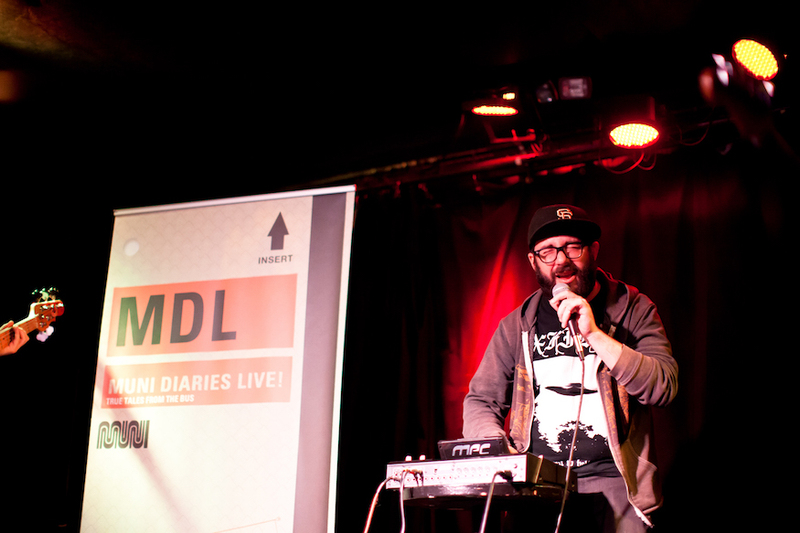 Your favorite biannual storytelling event, Muni Diaries Live, is about a month away. Come celebrate all the hilarity, camaraderie, and disgusting stuff that can happen on public transit in the Bay Area. And just added: comedian Matt Lieb and writer Wonder Dave! We’ll release the full lineup soon, so grab a ticket, pin us to your calendar, and we’ll see you on April 16!